Orange is definitely not the one of the colors I reach for most. But today’s shade is actually a favorite. 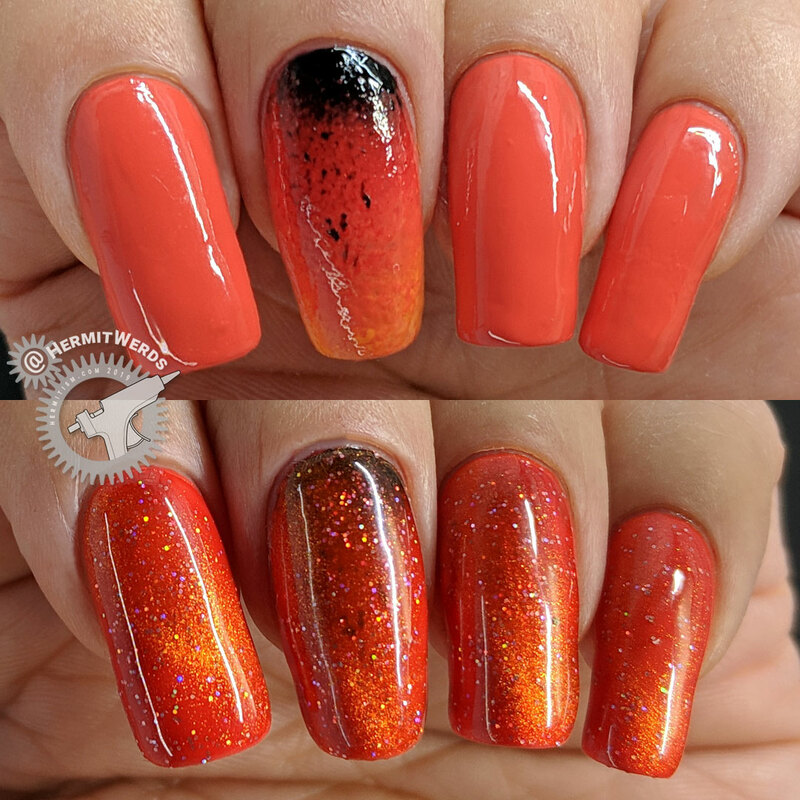 It reminds me of an orange glitter polish that I used up long before I started this blog. (I think it’s the only polish I used up pre-blog too. 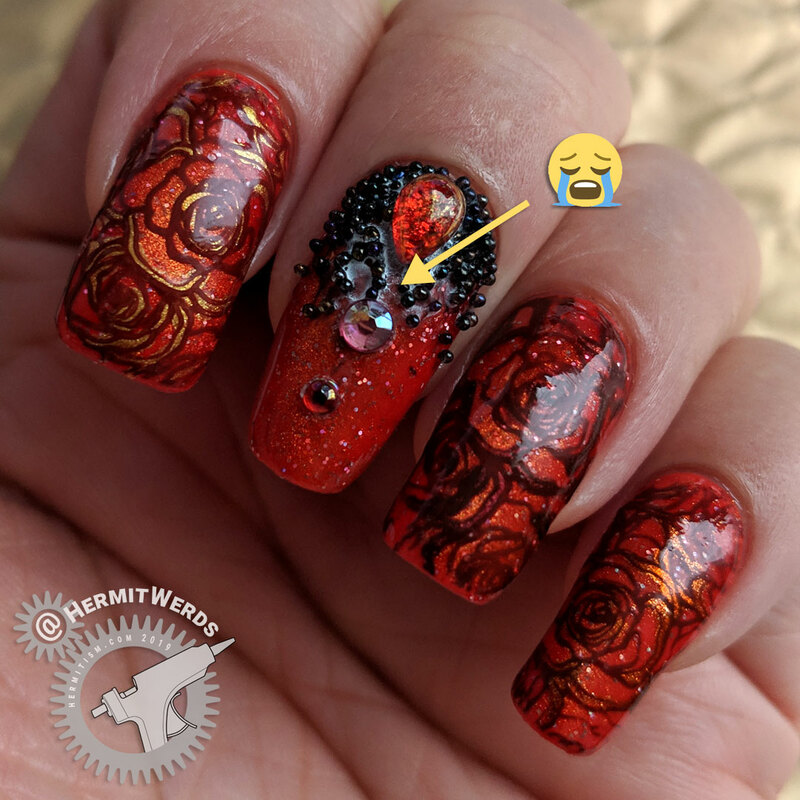 LOL) So today’s look features a glittery orange magnetic gel polish (J6490TM-6A) decorated with rhinestones (U0920-6A) and black caviar beads (J4200-3C) using a nail glue (J2441) and stamped with roses from the BeautyBigBang XL-003 stamping plate. This plate starts with 12 full-nail patterns and ends with a burst of nine butterflies and a small tree. Now the amazing thing is that none of the butterflies are repeats. With three more butterflies from the full-nail pattern, you have a total of 12 to pick from. That’s pretty awesome. 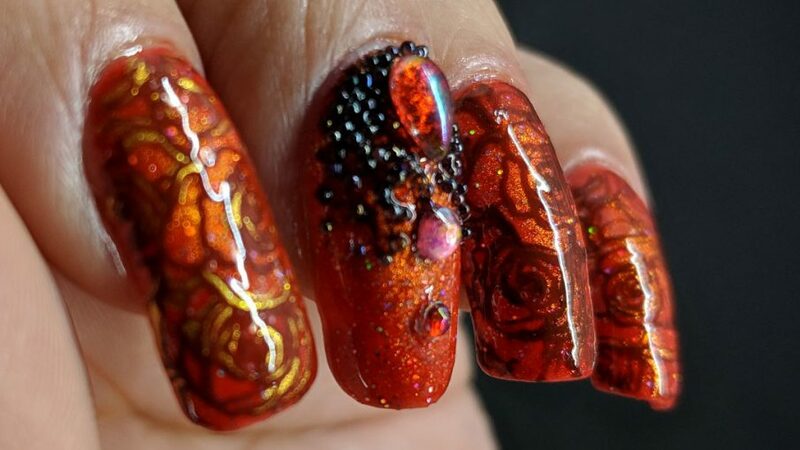 However, everything else is a pretty solid pattern so you’d need to turn to other stamping plates (or forms of decoration) if you weren’t into a butterfly design but wanted more layers. Another feature is the bottom left rose and the reverse tree images. Neither is actually a negative space image, but they do give equal space between the stamped and non-stamped spaces, which can be used to great effect. 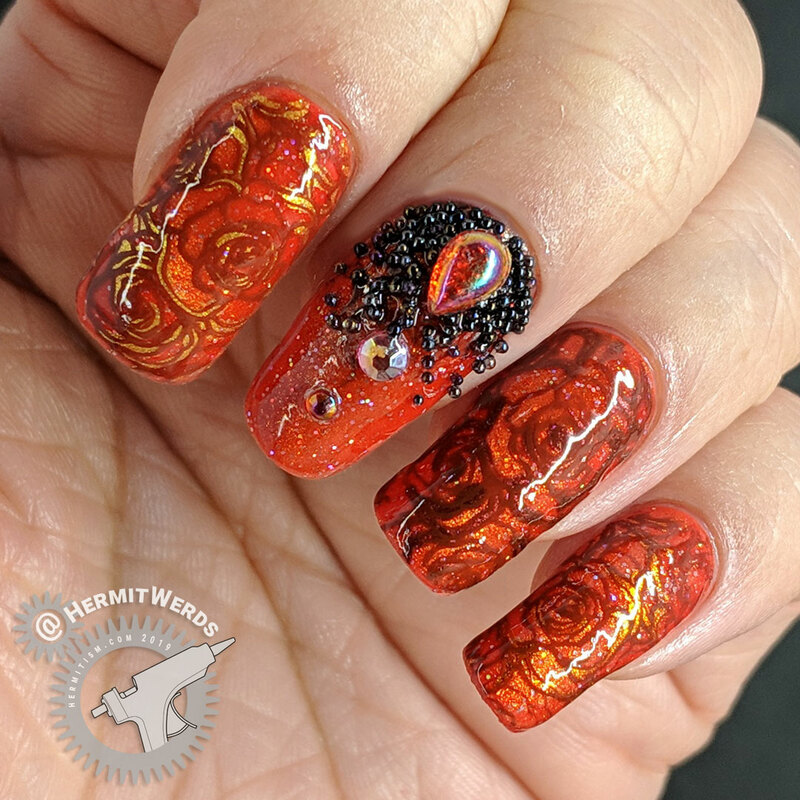 I couldn’t really pick a favorite from this stamping plate since I like so many of the images. And since I’m terrible at picking stamping plates that I can use for subtle background patterns, this was a very nice addition to my collection. The instructions for using BBB’s magnetic gel polishes recommend a black base. This a piece of advice that should be taken with a grain of salt. 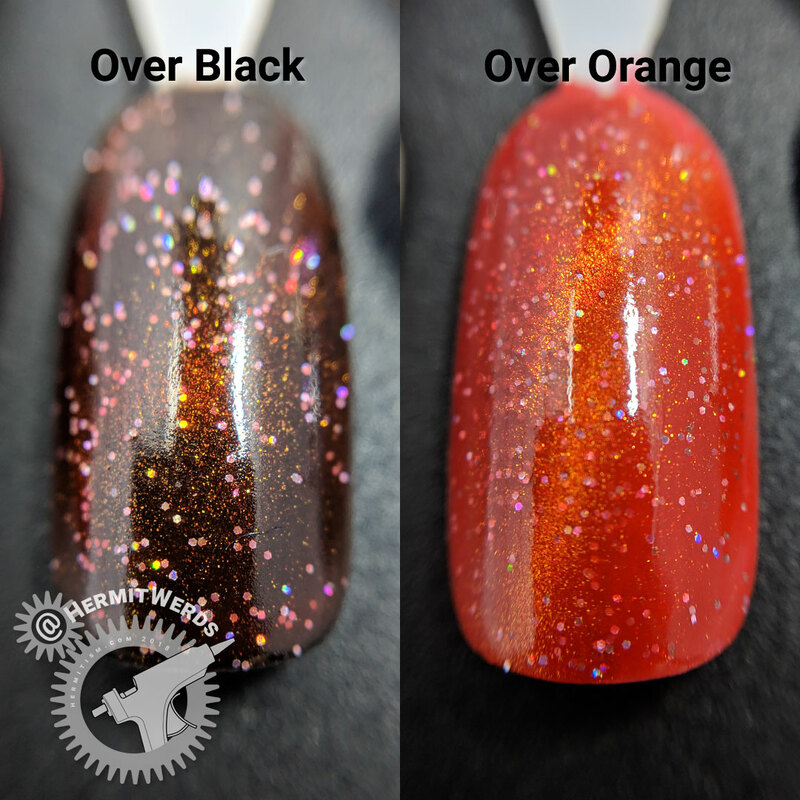 You can see in my sample swatch the difference between the using a black base (left) and an orange base (right). Using a black base with this particular polish will guarantee that your design does not look like the swatches on BBB’s site. However, with the other gel polish I will be reviewing in a few days, the black base does look like their swatch. So test out your combinations before you start painting your nails. I used two different oranges on the right swatch plus two more in my final look and you can’t tell much of a difference between them. I look forward to trying this product with more different shade underneath. I think it adds to its versatility. The disadvantage to all this is that I do not own an orange gel polish yet. 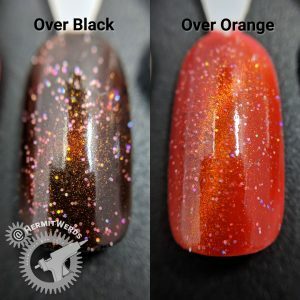 When using a gel polish over a regular polish, you need to give it looots of time to dry because, once the gel is on, your base will not dry any further. 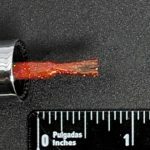 This can open up your mani to denting as the polish underneath is still too soft. Common wisdom is to let it dry overnight. I gave it about three hours and luckily that was enough for the polish I used. 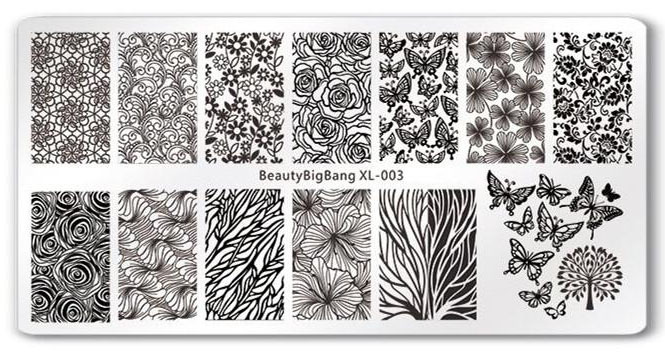 Beauty BigBang released a number of these 12-grid acrylic rhinestone sets. I liked this one the most. All of the rhinestones have an AB coating to make them more colorful. 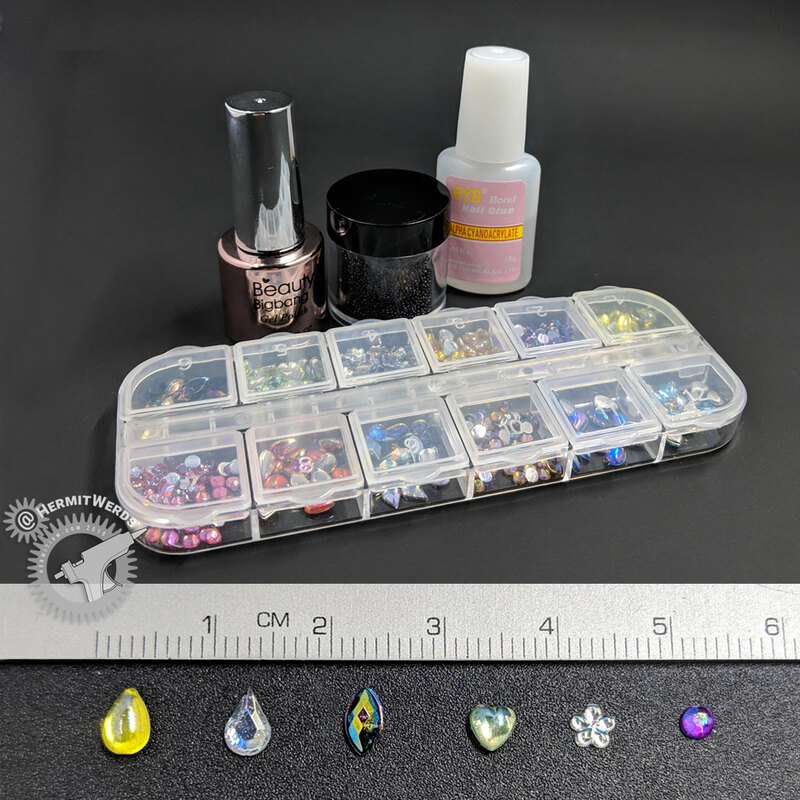 You get teardrops (yellow, orange, blue), pears (silver), marquise (black), hearts (gold, green, blue), flowers (silver), and 3mm rounds (purple, gold, pink) rhinestones. There does not seem to be a set number for each. Example: I had 20 each of the green/blue hearts and 23 of the gold. 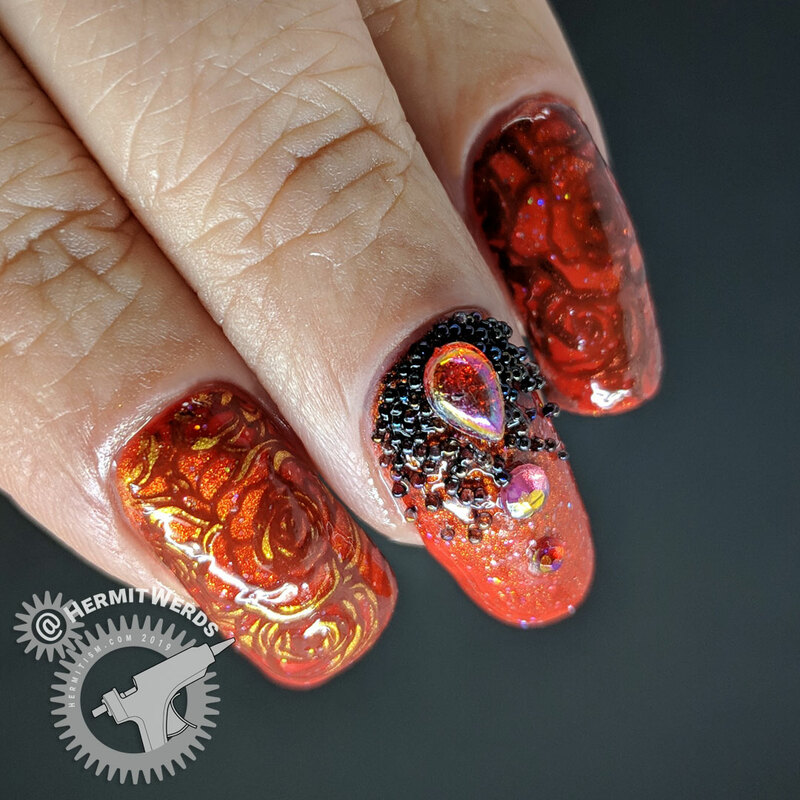 All of the heart and teardrop shaped rhinestones have a slightly rounded and slippery back, which makes it hard to get them to stick to a slick gel nail. It likely would have been fine if I hadn’t also been testing the nail glue because I would have applied these with the gel top coat. I love the finish on these, but they slid around a lot. Every caviar bead I have ever tried has been painted and the paint comes off if you mess with them too much. These were no exception. Now, with more practice, placement would be more precise and the risk of the paint coming off would go down. And with how much comes in the jar (which seemed to be missing its Beauty BigBang sticker), I have a lifetime’s worth to practice with. The beads are beautiful with an AB finish on top of the black and a slight variation in size. Caviar beads pair great with any rhinestone design and can be used to frame rhinestones or form lines. However, their rounded shape does mean they can fall off easily if you don’t secure them with enough glue/gel. I thought it would be nice to try the nail glue that Beauty BigBang sells on their site since I would also be reviewing nail decorations. Note: it is made by BYB, not BBB. I was…not impressed. I’m sure this will work great to hold on nail tips or for smaller rhinestones if you put the glue exactly in place. But for things like caviar beads and larger rhinestones, this is terrible. Luckily, Beauty BigBang has a UV gel for nail decorations that I may ask to review soon. 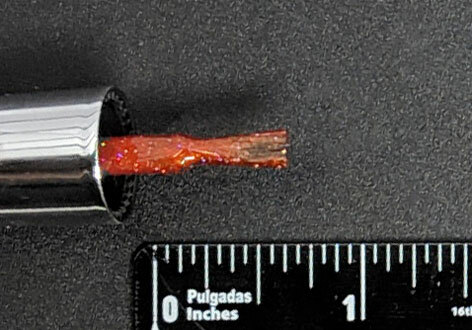 Also, don’t get this on your skin. It does not feel good and takes a lot of work to get off again. 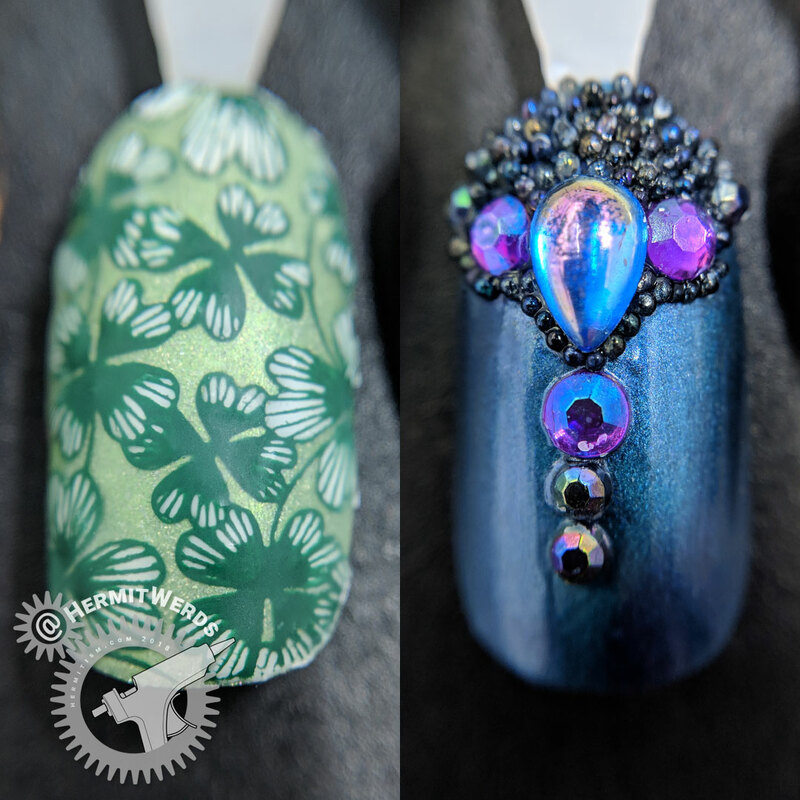 Holographic Clover. Background is Shinespark Polish’s “Peridot“. Stamping done with Mundo de Unas’ “Dark Green” and filled in with Smacker’s “Wickedly Stylish“. A Blue Heart’s Half-Moon. Background is China Glaze’s Magnetix “Sparks Will Fly“. 2mm black AB rhinestones from eBay. 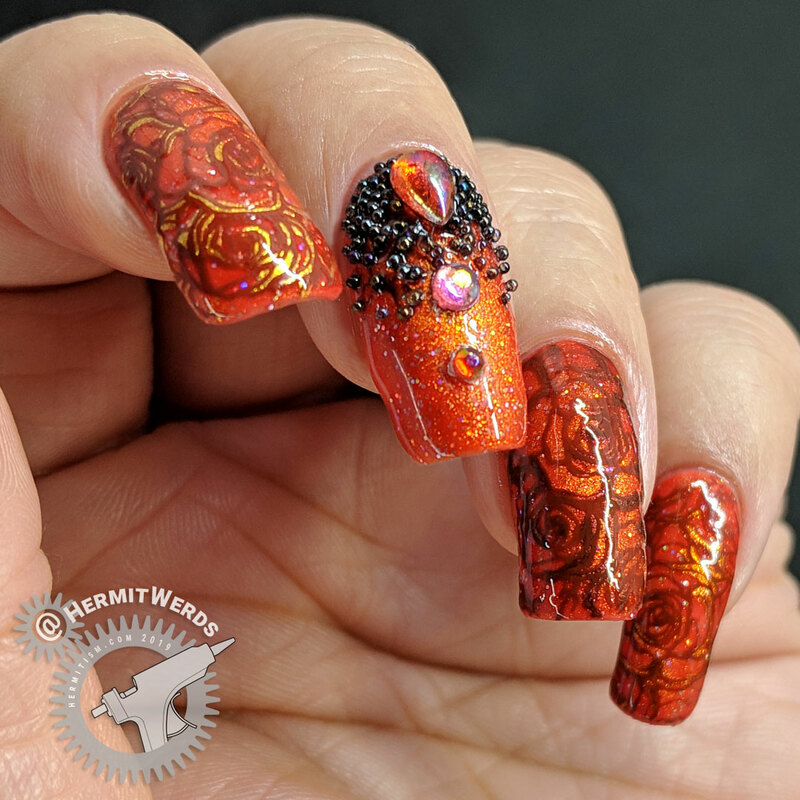 Even if I hadn’t had #GlamNailsChallengeFeb’s Roses prompt, I likely would have picked this subject to pair with such a richly colored polish as this orange. 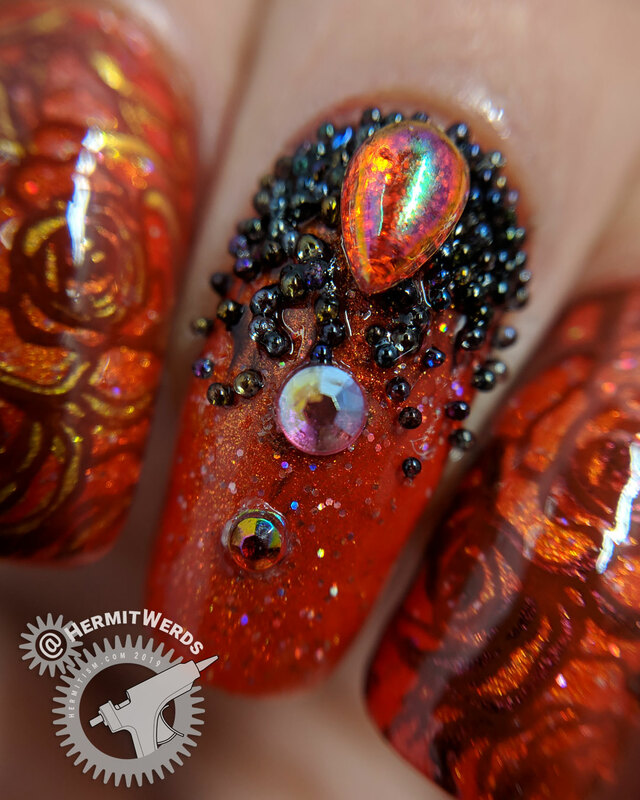 It was also really nice to get into making some nail art designs with bling. I’ve been meaning to do this for a while. I even bought a jar of those mixed rhinestones with caviar beads and still haven’t touched it yet. Maybe I will be more inspired to do so now! It probably would have been wise for me to stick with one color to fill in the decals. Oh, well. Because I used three different colors, I can definitely say I prefer it with the metallic yellow. Do you feel the same? Happily I have until next Sunday before I have to paint my nails again. I’m going to leave these on for a few more days.